Inflammation is a major player in many conditions — from heart disease to twisted ankles to accidentally hammered thumbs. This means it pops up in medical and health writing constantly. But from a health literacy perspective, is such a long, difficult word needed for such a common problem? Usually, the answer is no. Here’s our advice: Whenever possible, instead of using the medical term that describes the underlying cause of symptoms, just describe what people can actually feel or see. If you see signs of inflammation near the cut, call your doctor. If the area near the cut becomes swollen, red, or hot, call your doctor. Now, to be fair, inflammation is not the same as its symptoms — it’s a complex process in the body. You can’t change every “inflammation” to “swelling” and still be medically correct. But you can pay attention to context. When describing the process of inflammation, explain it carefully and clearly — leaving out the details of what those cytokines or prostaglandins are up to. The bottom line: Don’t inflame your readers with unnecessary jargon. 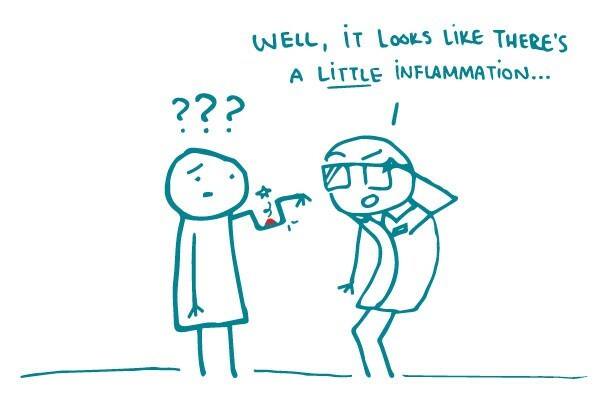 When you can, skip “inflammation” and just describe the symptoms.